Recently I encounter interesting behavior regarding amount of entries that DTP’s filter is able to populate. 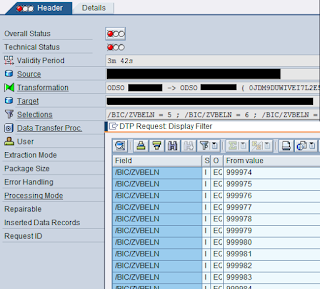 I created ABAP routine to fill up entries in filter. Since my routine produced quite big portion of data; I was curious how much entries is system capable to process. I still have an impression that load could be successful since I compared the data entries produced in filter and apparently they all were processed correctly. So I assume load would be OK. Afterwards I tried to lower number of entries produced by my DTP Filter routine. My intention was to get number of entries which system is able to process without this error. I succeeded with 21.001 entries. All higher entries like 21.002 ended again with error mentioned above. According this Note seems that this restriction was even lower in past. Till SP#16 restriction was 10.000 records. Since I did my testing in system based on SP#20; here’s restriction is 21.001 records. Would be interesting to check either this restriction is removed in newest version 7.3 of BW. Well, at least it is here according documentation available on help.sap.com. As it was announced during SAP TEchEd 2010 in Berlin NetWeaver 7.3 and along with that BW 7.3 is coming. Two weeks ago I noticed that BW 7.3 documentation appeared on hep.sap.com as well. SDN BW 7.3 page is still quite about general availability but NW 7.3 it should be released soon I believe. Fresh news out of SAP Note: 1407532 - Release Restrictions for SAP NetWeaver 7.3. Yesterday on November 29th 2010 SAP NetWeaver 7.3 entered Ramp-Up program. This means clients of SAP who participated in ramp-up can use it productively and they receive development support from SAP. Hope it gets into the unrestricted phase soon. See collection of materials related to SAP BW 7.3 here. I was curious how migration of BW features and objects from version 3.x to 7.x is supported by SAP functionalities. Especially what are the tools available (if there are any) and basically what does it takes to perform such an upgrade? I went through a lot of documents available on SDN and here’s the short summary of possibilities that we have in case of migrating particular BW objects within upgrade or migration projects.